Amid a rough patch for stock pickers, money has flooded into exchange-traded funds that aren’t trying to outperform the market. But several active fund managers see this year as a turning point for their industry. David Wallack, the portfolio manager of T. Rowe Price’s Mid-Cap Value Fund, which has $13.6 billion in assets under management, has been at it for 17 years. In January, he was named Morningstar’s Domestic Stock Fund Manager of the Year. In an interview with Business Insider, he spoke about what drives his investment process, and why active managers may outperform when the next downturn hits. Akin Oyedele: Financials are your fund’s top holding. At least in the last few months, that looks like a smart decision to have made. For how long have you been overweight and why? First Horizon and Northern Trust – sizeable holdings in the portfolio for a number of years – have unique attributes. Northern Trust has been around for over 100 years. It’s very well capitalized. It has a big share of market. It has wonderful name recognition. And, First Horizon is a medium-size regional bank based in Tennessee, has a large market share, is conservatively managed, has a good capital position, and is a potential M&A candidate. But in each case, you won’t really think of them [in the context of] the possibility that interest rates might actually go up. Most people had more or less given up because people had been saying that for five or six years and it never happened. So, I don’t know if interest rates will ever go up. But I have an attractive set of assets here which are reasonably valued, if not undervalued. We often have a significant position in financial stocks. I didn’t make some decision six months ago that this is the time to place money into financials. I’m generally not trying to time the market. I don’t have a strong view about what sectors are going to do well, interest rates and oil prices, or FX. It’s where are the interesting companies and how much money do I lose if I’m wrong relative to how much money do I make if I’m right? Oyedele: Is there more to your process than that? Wallack: That’s the essence of it. And then, there’s the work that goes into trying to identify companies that have a reason to exist, that have staying power. There are always companies whose share prices have fallen and stocks have underperformed. I sift through those all the time. And they’re always stocks that scream as if they may be cheap. But the work is around: what’s unique about this business? Are they in a good industry or an industry where the prospects are likely to improve? Do they have a management that is ethical as well as have business savvy? 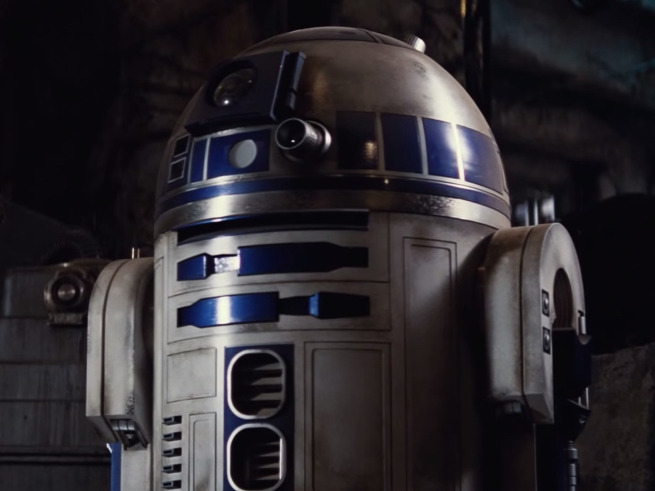 Do they have a pathway to improve profitability? Do they a balance sheet that can get them through this time [of being unprofitable] if it lasts years? Are there some hidden assets like a real estate portfolio, a stock portfolio, a joint venture that’s not making money? Tech companies sometimes have patents which have potential value not stated on the balance sheet. So, a lot of the work is, what’s unique about this company? Oyedele: An ETF of ETFs was recently launched, just to show how hot the product itself has become. You’ve had success picking individual companies. What are your thoughts on this ongoing debate? Wallack: It’s been a long time since we had booms in indexing, but we’ve had them before. The first time I can recall would be the late 80s when investing outside the US was often done by indexing the EAFE, replicating the EAFE [Europe, Australasia and Far East] index, which 30 years ago was 60% weighted in Japan. If you had replicated that index in 1988, in 2009, the Nikkei 100 had lost 84% of its value. I would submit that was a pretty poor way to deploy your capital. It seemed simple. It seemed easy. The Japanese stock market market had gone up for 10 years. Japanese stocks were very overvalued, and there was eventually a reckoning. The market can take leave of its senses for an extended period of time and eventually, stocks trade at their underlying value. The second one would be the tech bubble, when the S&P had 30% of its weight in technology stocks. In the three years from March or February of 2000 to February of 2003, the S&P was down 45% and lots of active managers outperformed significantly. So, active management has done well typically in more challenging market environments, but keeping your money is in some ways more important than making it. Losing money will set you back; it’s very hard to recover from losses. If you take the perspective of history, there are active managers who have proved themselves over extended periods of time – T. Rowe Price I’d have to say is one of them. I can’t help but think that there may be a period when folks who are putting their money into index products are going to regret it a few years from now. This is not a prediction, but just an observation that indexing has had its waves of popularity before. It hasn’t proven to be wise to deploy your capital there. Oyedele: So it’s very cyclical. Wallack: It has been in the past. That’s not to say that there isn’t a place for it. It’s here to stay, I’m sure, and there plenty of active managers who have performed poorly. Why should you give your money to an active manager who performs poorly and is charging you high expenses? That doesn’t make sense. Those people, in my view, will over time disappear. Man GLG, a UK hedge fund overseeing $28.8 billion of assets as of March 31, is embracing machine learning. The group has created a new position titled “head of machine learning.” The new role will oversee development of Man GLG’s machine learning capabilities involving news and social media analysis, breaking market news, and visualizing complex data. The firm has hired William Ferreira, formerly of Florin Court Capital, for the role. Ferreira previously worked as Technology Manager for Man AHL from 2011 to 2014. In that role, he was Chief Technology Officer for Man Systematic Strategies. “I am excited about the opportunity to build Man GLG’s machine learning capabilities, developing tools to support the firm’s portfolio managers as they run high-conviction active portfolios,” said Ferreira. Man GLG isn’t the first fund to try and make better use of the flood of data now available. Hedge funds have been turning to a “quantamental” investment strategy, using computer algorithms to comb through large data sets. In doing so, the funds are hoping to predict market behaviors to gain even the slightest advantage over competitors. The practice, which uses complex algorithms to analyze multiple markets and execute orders based on market conditions, has divided Wall Streeters into two camps: those who think the stock market has benefited from their existence, and those who argue to the contrary. What’s not in doubt, however, is their overall impact on the stock market. “They’ve firmly established their place in the market ecosystem, primarily serving as a facilitator connecting buyers and sellers through time, but also frequently criticized in that role for being superfluous, or worse, predatory,” Credit Suisse strategist Ana Avramovic said in a recent note. “Whatever your view, their impact has been wide and, likely, lasting,” she added. In a note, titled We’re All High Frequency Traders Now, Avramovic ran through four ways HFTs have impacted the market. 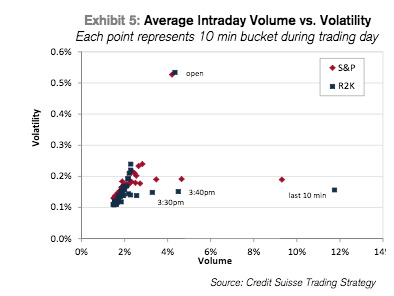 Higher trading volumes are HFT’s “largest, longest lasting, and most visible impact,” according to Credit Suisse. There are complaints that this activity isn’t “real” activity, but rather that this increase is down to unnecessary trading, or is designed to take advantage of slower moving investors. 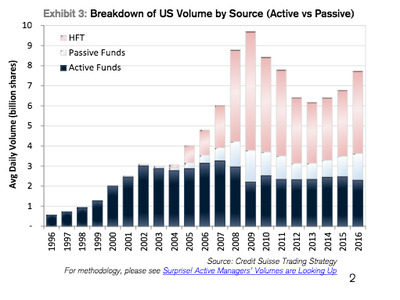 “While that can be true … a majority of HFT activity serves to connect those natural buyers and sellers and reduce waiting times, often substantially so,” Credit Suisse said. A bid-ask spread is an important concept on Wall Street. It refers to the difference between the price at which someone wants to buy an asset (bid price), and the price at which the seller wants to sell that asset (ask price). The tighter the better, in theory. 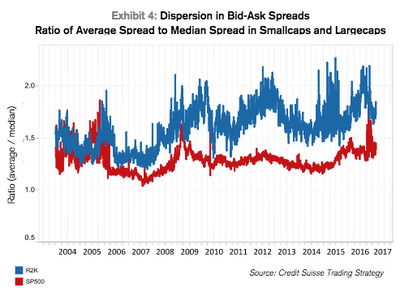 The rise of HFT has seen a divergence between bid-ask spreads for large cap stocks (they’ve tightened) and small caps (they’ve widened), suggesting a concentrating of trading in the most liquid, biggest stocks. Large-cap stocks and small-cap stocks also see the most volatility at different times of the day. “Small caps do seem to experience larger price gaps, yet they tend to have less of the small fluctuations; largecaps, by contrast, with their large presence of market makers, may experience something like “flickering quotes” as the price bounces rapidly between the bid and ask, particularly at the end of the day. It appears that the long-awaited Article 50 trigger, officially beginning the Brexit process, will take place next Wednesday, March 29, because moments ago a Theresa May spokesman confirmed a report in the UK’s CityAM, reporting that Article 50 will be triggered next Wednesday. U.K. envoy to European Union Tim Barrow informed European Council President Donald Tusk’s office of Brexit trigger date Monday, Prime Minister Theresa May’s spokesman James Slack tells reporters in London. EU Council president Donald Tusk is now expected to respond formally within 48 hours although the detailed EU negotiating position is not expected to emerge until later in the spring. Thus the audits of the Deep Storage gold consist of two conventions gold verifications, which are the physical audits of gold bars inside the compartments. And OJS inspections, which are checks of the seals placed on the compartment doors. The superintendent in the audit procedures is the Office Inspector General of the US Treasury, in short, the OIG. Swing voters are a fickle bunch. One election they vote Democrat. The next they vote Republican. For they have no particular ideology or political philosophy to base their judgment upon. The primacy of the wallet. They don’t give a rip about questions of small government or big government. Nor do they have any druthers about the welfare or warfare state. In effect, they really don’t care. What’s important to the swing voter is much simpler. In fact, it can be boiled down to the following essential question. What have you done for me lately? The answer to this question, of course, comes back to money. As far as the swing voter’s concerned, if their brokerage account’s growing they vote the incumbent party. If it’s shrinking, they vote the challenger party. It doesn’t matter if the source of the stock market inflation is a fraud. Nor does it matter that a stock market correction will help reestablish financial markets on a firmer foundation. In this respect, the mere trajectory of the swing voter’s portfolio tells them everything they need to know about whom to vote for. Earlier this week Republican Presidential Candidate Donald Trump took issue with the Federal Reserve’s stock market inflation games. With his tireless work for the poor and the middle class finally done, Barney Frank waved good-bye, to sail off into the well-appointed retirement of a Congressman. Recently he felt the need to pipe up again, dispensing advice to the “independent” Federal Reserve. Obviously, a monetary policy change toward tighter credit, and the subsequent stock market swoon prior to an election can mean death for an incumbent party. Just ask former President George H.W. Bush. He’ll tell you that former Fed Chairman Alan Greenspan cost him the 1992 election. From an axiomatic perspective, the truth of a political accusation is equal to the denial that follows. In other words, the greater the subsequent denial is, the greater the truth of the allegation. “Politics simply does not come up,” said Kashkari. We suppose Kashkari had his fingers crossed behind his back when he uttered this. Because given his checkered past, he’s simply not a man to be trusted. Kashkari, without question, is an extreme economic interventionist. If you recall, as federal bailout chief, he functioned as the highly visible hand of the market. In early-2009, he awoke each morning, put on his pants, drank his coffee, and rapidly dispersed Henry Paulson’s $700 billion of TARP funds to the government’s preferred corporations. Kashkari’s former partner in crime, Hank Paulson. They had to destroy the village to save it – or so they said, anyway. Incidentally, the experience had an ill effect on Kashkari’s mental health. Following his position of federal bailout chief, he became a hermit, took to a cabin in the Sierra Nevada Mountains – near Donner Pass – and found his purpose in life chopping wood (for an image of Kashkari the wood-chopper, see here). We thought we’d seen the last of him. But alas, after a failed gubernatorial campaign in California in 2014, Kashkari resurfaced earlier this year as Minneapolis Fed President. The world is a worse place because of it. Kashkari’s a man with crazy eyes. But he’s also a man with even crazier ideas. After stating that politics is not part of presidential election year Fed policy, Kashkari explained how Fed policy is set. Neel Kashkari: Crazy eyes and even crazier ideas. “We look at the data,” he said. In hindsight, this clarification was more revealing than the initial denial. Clearly, Kashkari has never thought about what exactly it is he is looking at when looking at the data. If he had, he’d likely conclude that the approach of using data to identify apparent aggregate demand insufficiency and perceived supply gluts is crazy. Unemployment. Gross domestic product. Price inflation. These data points are all fabricated and fudged to the government number crunchers’ liking. What’s more, for each headline number there is a long list of footnotes and qualifiers. Hedonic price adjustments. Price deflators. Seasonal adjustments. Discouraged worker disappearances. These subjective adjustments greatly affect the results. Yet what’s even crazier is that Kashkari believes that by finagling around with the price of money the Fed can improve the output of bogus data. According to central planners, better data – i.e. higher GDP, greater consumer demand, 2 percent inflation – means a better economy. But after 100-years of mismanagement, the last eight being in the radically extreme, the Fed has scored a big fat rotten tomato. The data still stinks – GDP’s still anemic. But the downside of their actions is downright putrid. How much economic progress has monetary central planning actually cost us? This cannot be quantified, but we are willing to bet that in combination with the socialistic welfare/ warfare state that is partly funded by this surreptitious theft, we have lost the equivalent of one or two centuries of real wealth creation as a result of compounding effects and historical political developments (primarily war) that would have been impossible without limitless credit expansion. Once this gigantic bubble implodes for good the damage will become even greater – click to enlarge. Policy makers have pushed public and private debt well past their serviceable limits. They’ve debased the dollar to less than 5 percent of its former value and propagated bubbles and busts in real estate, stock markets, emerging markets, mining, oil and gas, and just about every other market there is. Aside from enriching private bankers, we now know the answer to why the Fed destroyed the market economy. According to Kashkari, the data told them to. Addendum: Have you Seen this Man? If Britain leaves the EU and if the reaction to Brexit causes years of uncertainty, the EU will reap what it has sowed. British discontent is only a precursor to unrest on the Continent, where populists from across the political spectrum feel they have lost control over their fate, and are gaining popularity. We’ve seen the transfers of power to the European level after ignoring the referendums on the European Constitution in France and the Netherlands in 2004. We’ve witnessed the refusal to allow Grexit, which could have been an alternative for continued fiscal transfers and interventions into national budgetary decisions. Both have created a lot of discontent and anti-EU sentiment since 2010. Last year, there was the decision to outvote Central and Eastern Europe on the sensitive issue of forcing countries to accept refugees, which isn’t even possible in a passport-free zone, as people can travel freely, but which was decided to divert attention from criticism on Angela Merkel’s controversial refugee policy and to organize yet another transfer of power to the EU level. Finally, we could see how Prime Minister David Cameron’s proposals to bridge the gap between the EU and citizens were met with a lukewarm reaction. His proposal, for example, to allow national parliaments to block EU proposals was watered down to make it harder to implement. If the British vote to ‘Remain’, they most likely won’t do so with a majority of more than 60%. That however is the threshold needed, according to pollster Comres, to really settle the debate for the next few years. With a narrow victory for the ‘Remain’ camp, it is therefore more than likely that the debate would just start over the next day, very much like the Scottish demand for independence which has remained a prominent feature in UK politics after 44.7% of Scots voted to secede from the UK in a referendum in 2014. If people vote to ‘Leave’ the EU, the government is likely to activate article 50 of the EU Treaty, which foresees that the status quo is maintained for two years and that both parties are given the chance to renegotiate their relationship. Many think that two years will be much too short for this. The British government thinks that there could perhaps be 10 years of uncertainty, while EU Council President Tusk has mentioned seven years. Some in the ‘Leave’ camp have claimed that there may even be a second referendum after a Brexit vote, whereby Britain would get the chance to remain in the EU after all, but under better conditions than those negotiated by Cameron in February this year. It’s unlikely that the UK would want a relationship similar to that between Norway and the EU. Norway may have complete access to the European single market because of its membership of the European Economic Area but in exchange it needs to comply with over a set of EU rules without having any influence over them within the EU institutions. That surely won’t be an option for a country which just would have left the EU because of a desire to have more sovereignty. Also, to have the EU-Canada trade deal (CETA) as a model, as advocated by the ‘Leave’ campaign’s Boris Johnson, may not be appealing, given the lack of access the financial services industry would enjoy to the EU market. The British may prefer something like the Swiss model instead, which means that the UK and the EU would negotiate which markets they would open to each other and which rules they would harmonise or mutually recognize. At the moment, a Swiss firm like Credit Suisse is based in London in order to be able to access the EU’s single market, so some extra hurdles may emerge. Whatever trade relationships are pursued by a post-Brexit Britain, it’s very possible that a Brexit vote would unleash protectionist sentiment on the Continent and that the EU would want to punish the “naughty pupil” by means of limiting market access for British financial firms. Diplomats have already made clear that both France and the EU Commission are keen to “punish” the UK if it would vote to leave, while Germany, which exports a lot to Britain, is planning to be more conciliatory in the event of a vote for Brexit. This protectionism would both hurt Britain and the Continent, given that the City of London can be seen as its financial lifeline. It would in any case be similar to the EU’s reaction to Switzerland, after the Swiss expressed in a referendum the desire to restrict free movement for EU citizens and the EU Commission essentially refused to negotiate. British proponents of EU membership have made the case that Cameron’s deal guarantees that the “high-watermark” of EU intervention in British policy has been reached. But EU opponents have questioned how legally binding the deal is, leading to obscure debates on the relationship between international and EU law. They have claimed that even after threatening the nuclear option – a referendum on Brexit – Cameron didn’t manage to obtain more than what they consider to be peanuts. One thing is certain: if Brexit marks the beginning of the end of the EU project, many of those responsible are to be found in Brussels. The firm polled more than 100 private equity investors and found that 36% of them are pouring into private equity, while infrastructure and real estate are also proving popular. It’s worth noting here that Coller Capital is a private equity secondaries firm, providing liquidity in private equity markets. As such, one could expect them to take a brighter view of private equity investments and have a somewhat less favorable outlook on hedge funds. Regardless, these results seem to be more evidence for investors’ lack of confidence in hedge funds, which have taken a beating amidst volatile commodity price and losses from big, concentrated bets. Billionaire Steve Schwarzman of the private equity giant Blackstone Group has said he has little sympathy for those struggling in the hedge fund world. 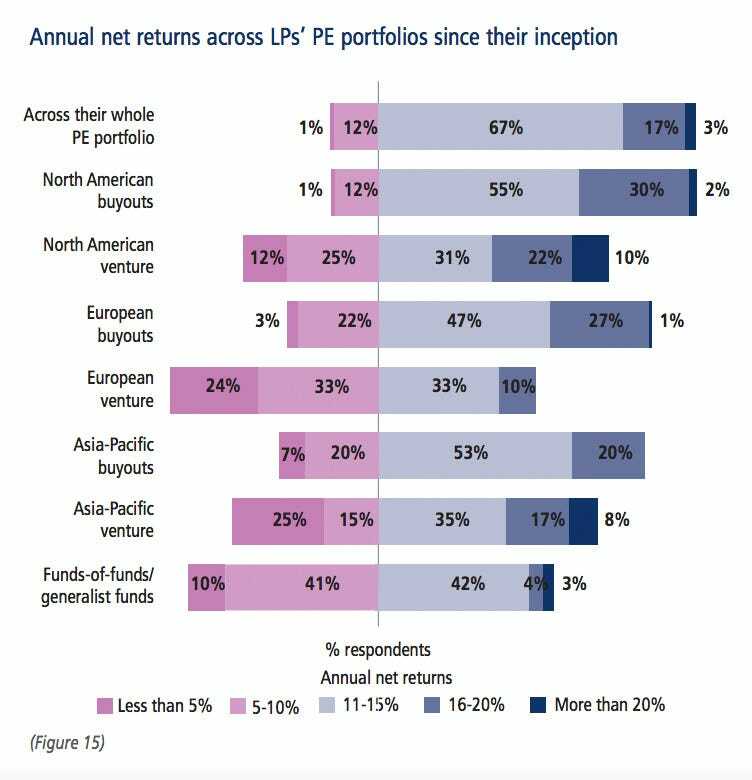 Hedge fund investors — including pensions, endowments, sovereign wealth funds, and insurers — have seen a massive mismatch between their expected returns and actual returns from their portfolios. 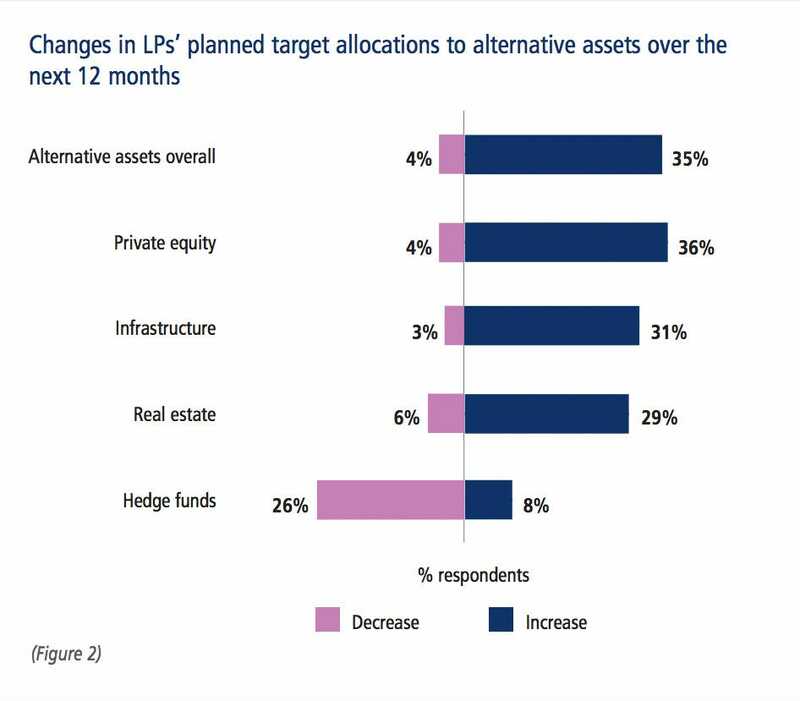 In contrast, 79% of investors in the survey said they will not change their commitment to private equity despite the recent market volatility. An appetite for private equity can be seen from the nearly $10 billion fund that Leonard Green & Partners raised, as well as Blackstone’s $18 billion global fund, and KKR’s $11 billion fund. It appears the “herd” was right last time. Everyone knows that the US, China, and the EU are some of the world’s biggest economies. 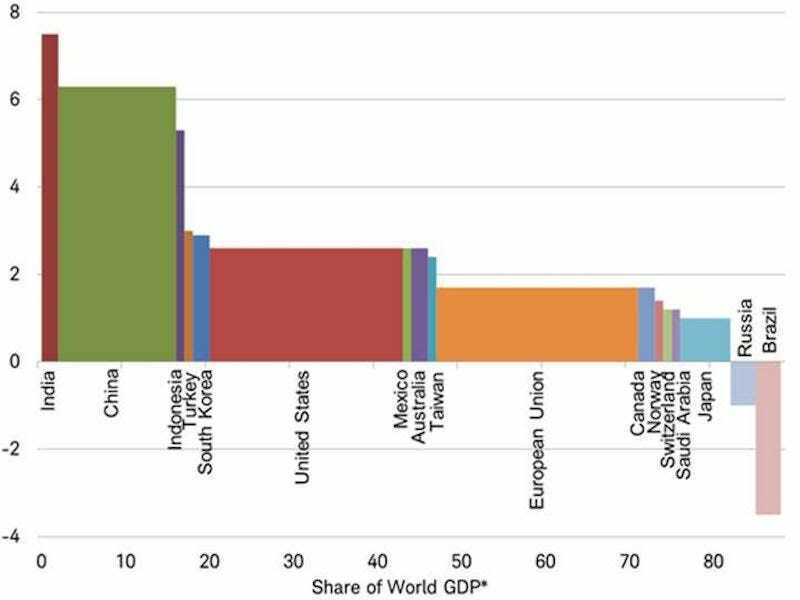 But sometimes it’s difficult to visualize how these economic powerhouses look relative to other major economies. So to represent how much each big economy matters to global growth, Charles Schwab’s Jeffrey Kleintop put together a chart showing the major economies’ share of world GDP and their 2016 growth forecast by the IMF. It’s notable that some of the fastest growing economies like India and Indonesia have less weight on the global economy, while the US economy is growing at a slower pace but has significantly more weight. Another interesting comparison is China versus the EU. In terms of GDP, the EU is twice as big as China, but China’s (slowing) growth rate is still much greater than that of the EU. And while both Russia and Brazil are looking at a grim year of growth, they are significantly smaller chunks of the global economy than many of the other countries on the chart.